SG-1 is invited to Tollana to attend the funeral of Omoc, a respected member of the Curia. 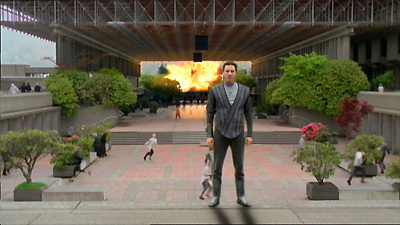 Following the service, Narim secretly passes a message to Carter, a holographic image which warns that Omoc had believed Earth to be in grave danger. It had always been the Tollan policy not to share technology, and when Chancellor Travell speaks off the record of a shift in Tollana's isolationist ways, and offers to provide Earth with an ion cannon, Narim becomes suspicious. His investigation suggests that Omoc may have been murdered to make way for the new shift in policy. SG-1 begins to share Narim's suspicions when their request to expand the trade agreement to 38 ion cannons is accepted, and missing Curia records suggest a government conspiracy of massive proportions. Despite his fears of treason, Narim is convinced to assist in the investigation. He breaks into Travell's office, discovering disturbing secret records of a Goa'uld ship with advanced shields that had been impervious to the Tollan ion cannons. It had left the planet peacefully, but shortly afterward, the Curia began overseeing the production of weapons of mass destruction which use phase-shift technology, making them capable of passing through solid matter. When SG-1 is apprehended, the reason for the Tollan deception becomes clear. Tanith arrives, now serving a powerful but unnamed Goa'uld whose advanced technology has made Tollana vulnerable for the first time. To prevent their destruction, the Tollans had agreed to build weapons for the Goa'uld, and Tanith's first demand is that a test weapon be sent through the stargate to penetrate Earth's iris. Risking the destruction of his planet, Narim destroys the facility of weapons, allowing SG-1 to escape, and making Tollana a target. The Goa'uld attack, and the Tollan defenses crumble, leaving the fate of Tollana unknown. Because of the Goa'uld threat, the Curia was forced to change its views on its isolationist ways. Omac favored the old ways. His death was probably murder in order to shift the Curia vote in favor of allowing the trade of technology. The SGC has access to an off-world trinium mine. A trade agreement was reached for a supply of trinium in exchange for the Tollan ion cannon. Earth would need 38 ion cannons for an effective network to protect the planet from attack. Every Tollan has a small implant that monitors his health. Implants are linked to a central system allowing the immediate dispatch of health officers in an emergency. The delayed response to Omac suggests that he was murdered. Crime is very rare on Tollana. Tollan law considers lying by the government to be an even more heinous crime than murder. Trinium is required to house any device that generates the Tollan phase-shifting technology, allowing it to pass through solid matter. Tanith left Apophis's ship in an escape pod before the destruction of his fleet by the supernova near Vorash. He now serves a powerful Goa'uld whose name he won't reveal. His Goa'uld mothership has defensive shields making it impervious to the ion cannons. The Curia was forced to agree to build weapons of mass destruction using phase-shift technology for use by the Goa'uld in return for preventing the destruction of Tollana. The weapons will penetrate solid matter prior to detonation. The intention was to force the Tollans to send a weapon to Earth through the iris since the Goa'uld cannot attack Earth directly due to its status as a Protected Planet. The final transmission from Tollana reported that all defenses were failing, some people had escaped, the stargate was destroyed, and ships attempting to leave the planet were being shot down.